Once you've added a shape, you'll want to be able to refer to it in the future - and you'll also need to know how to position it exactly where you want on the screen. However, referring to a shape by its index number within the collection of shapes clearly isn't a reliable method. 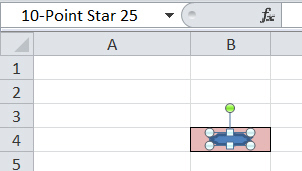 Shape names are a bit strange in VBA, and are not necessarily unique. Rather than trying to understand the rules, the simplest thing is to generate and assign unique names yourself for shapes that you've created programmatically. To position a shape in the shaded cell, we just need to know the two distances shown. The shape is half the width of the cell, and half its height. 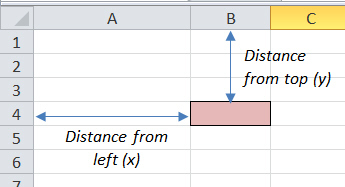 This code will position the shape relative to the top left corner of the cell, rather than of the worksheet. One thing to watch is that the units for column widths/row heights aren't the same as for shapes! Now that we know how to refer to our shapes (and how to position them where we want on screen), it's time to make them look pretty!